Ariana Alvarez, Director of the Title IX & Sexual Harassment Policy Compliance Office (Title IX) and Title IX Officer, is responsible for oversight of campus activities designed to implement, expand on, and ensure full compliance with Title IX and all related State and local laws proscribing unwanted sexual contact, unsolicited sexual displays, speech, or other behaviors associated with evolving definitions of sexual violence and sexual harassment. Mx. 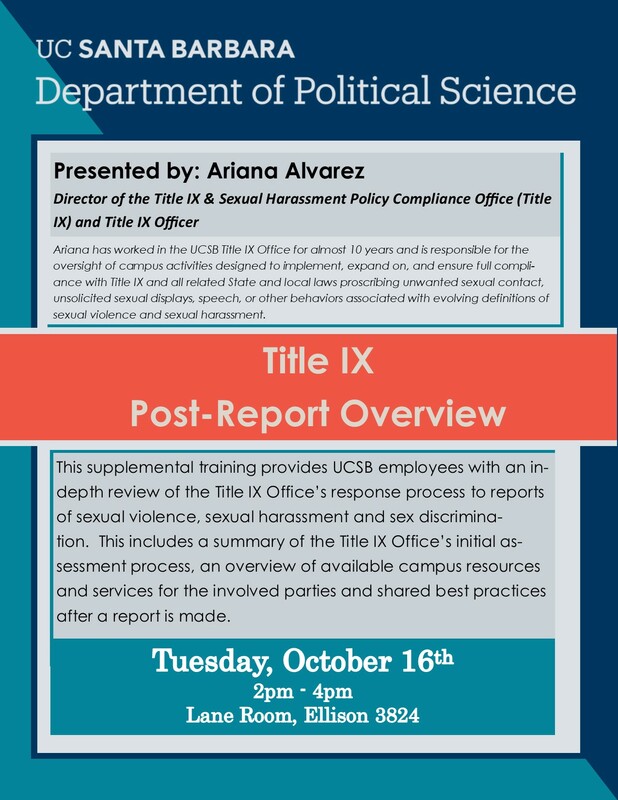 Alvarez has worked in the UCSB Title IX Office for almost 10 years, and her experience includes over 20 years of practice in discrimination and harassment investigations, prevention education & training and testing in various industries including higher education, public accommodations, insurance, public housing, franchise investment and government employment. Update: Stephanie Yahyavi will present this talk as Ariana is unable to attend.